“One blizzard came just before time for school to close. . . .
At a country school eight miles north of De Smet, the teacher [had] brought his children to school in a sleigh. . . . [Going home,] the teacher, with his load, was lost on the prairie. There were a lot of long shots in the research for Pioneer Girl. We look at Wilder’s life through a double pane of frosted glass, trying to overcome both the shortfalls of her memory and our own distance from the subject. Not all of our long shots hit the target. But today, to tide you over until the book arrives, I’d like to tell you about one long shot—perhaps the longest one of all—that did. Wilder places the story of the schoolteacher and his improvised igloo in the winter of 1884–1885, but the setup is strongly reminiscent of the “children’s blizzard,” a storm that struck without warning on a warm day in January 1888 and killed more than a hundred schoolchildren as they struggled to get home. Wilder did not always remember events in their true chronological order, and it seemed likely that she misplaced this one. But she does not give the teacher’s name, and the Kingsbury County newspapers that could complete the story have been lost, so there, it appeared, the matter would rest. The scene: it’s about 10:30 one morning and a deadline looms. Enter Pioneer Girl Project director Nancy Tystad Koupal with a grin on her face and a book in her hand. “Mr. Stearns, a Dakota schoolteacher, had taken his three children to the school he taught near De Smet the day before and still had not returned home” (Laskin, Children’s Blizzard, p. 218). Unfortunately, there’s no footnote and no follow-up. We still had laughably little information to work with. What were the odds? Still, the circumstances were tantalizing: here was a schoolteacher, near De Smet, whose own children were among his students. And critically, he had a name. It was federal records time. Census first. Ready? No Stearns in the area in 1880. 1885 territorial census for the county is lost. 1890 federal census is melting the ice caps. 1895 state records are lost. 1900 federal census—stop!—there’s one. Orion E. Stearns. Spirit Lake Township, Kingsbury County. Farmer. Born Vermont, August 1847. He and his wife have had five kids, of whom three survive; two are still in the household. Now we’re cookin’ with Crisco. We have his name and his year and state of nativity, and we can follow this man, whether he’s Wilder’s man or not, wherever we want to. Orion’s daughter Bessie is a schoolteacher; does it run in the family? Orion Stearns is teaching school in 1870 in Trempealeau County, Wisconsin. It doesn’t prove that he taught in 1888. But let’s say you’re a homesteader and you have teaching experience. What would you do in the winter to earn a little extra money to help prove up your claim? Maybe this wasn’t a fool’s errand after all. I look at the clock. Between this and other tasks, it’s now 6:30, and I am not going home until this is settled. But have I gotten ahead of myself? 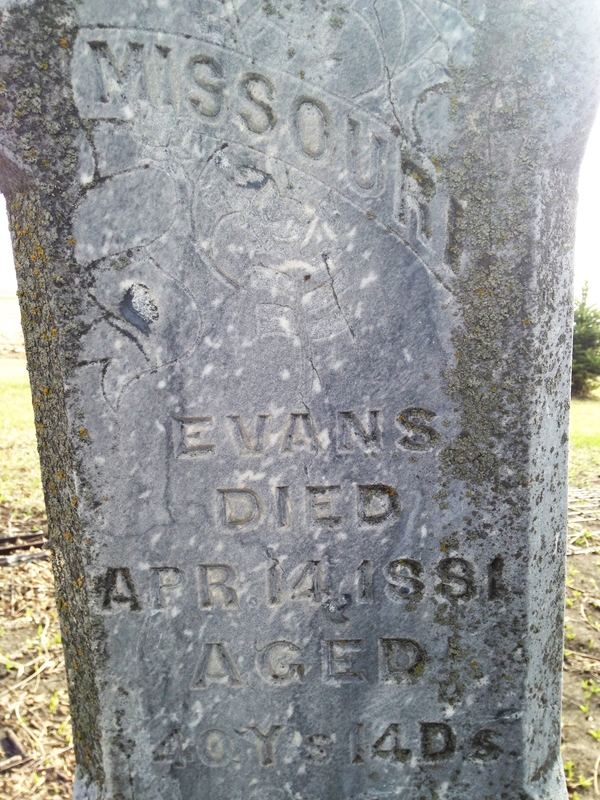 We still don’t know if Orion Stearns was even in Dakota Territory in 1888. But the U.S. General Land Office might. Guess what: it does. On August 16, 1889, Orion E. Stearns was issued a patent under the Homestead Act for a quarter section seven miles northeast of De Smet. At this point my heart finally says: this is the guy. But that’s not enough. It’s a pretty safe bet that he was there in 1888, but I can’t be absolutely sure unless I order the paper land-entry records, which will take a month to arrive. Wait. I have other evidence right under my nose. Remember his two kids living with him in 1900? The census shows that his son Sumner was born in Dakota Territory in 1885. Again, I can’t be certain they were in Kingsbury County, but we’re building a strong preponderance of evidence. This is the guy. While we’re at it, what other evidence can we glean from the kids’ census entries? Little Sumner would have been too young to go to school in January 1888. Orion’s four other kids appear in the 1880 census: Lewis, Guy, Nellie, and Bessie. And then I remember that by 1900, only one of the three eldest kids was still alive. That’s when I start checking grave records. Ten minutes later I’m in the State Archives library. This started with a book; let it end with a book. Ten minutes after that, it’s over. Beyond a doubt, Mr. Stearns was the man Wilder remembered, and I know exactly what happened to him and his kids on January 13–14, 1888. The long shot slams right into the bullseye. And all I can think is, No. That isn’t how the story is supposed to end. The story ends with annotations 90–91 on pp. 315–16 of Pioneer Girl: The Annotated Autobiography. It’s a book full of long shots, gunshots, schottisches, and everything else from the world of Wilder, and it finally ships out next week. Thanks for your patience, thanks for reading our blog, and stay tuned for more. 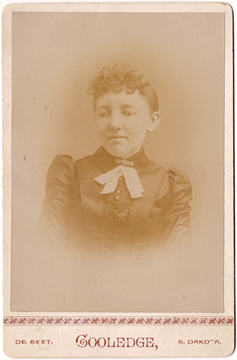 As readers of Laura Ingalls Wilder’s books know, courting was a special time in Wilder’s life—a time when the set of her clothes and the condition of her hair were especially important to the young Laura Ingalls. The same is true in Pioneer Girl, where Wilder lovingly describes her poke bonnet, her brown poplin, and her lunatic fringe, among other fashion details. We see Laura primping before the mirror and sewing items of clothing with care. Almanzo’s perspective during the same time period, meanwhile, is left pretty much to the reader’s imagination. Did he primp and preen before he went to visit Miss Ingalls, or was that solely a woman’s prerogative? We have in our family [at] present a young man who is deeply, we trust successfully, engaged in going a-courting. . . . When Sunday afternoon arrives it is plain to see that something is about to happen. Our young man is fidgety and non-communicative and cannot sit in one place half a minute at a time. He is continually interviewing his watch and comparing it with the old eight-day, coffin-shaped clock in the corner. He looks in the glass frequently, and draws his forehead locks first back and then forward, and combs them up and puts them down, and is unsatisfied with the effect throughout. The smell of bay rum and bergamot is painfully apparent. When he shakes out his handkerchief musk is perceptible. His boots shine like mirrors. There is a faint odor of cardamom seeds in his breath when he yawns. He smooths his . . . mustache with affectionate little pats, and feels his . . . side whiskers continually. . . . He tries on all his stock of neckties without finding just the thing; and he has spasms of brushing his coat, that commence with violence and last till one grows nervous for fear the broadcloth will never be able to stand it. . . .
And at seven, he sets forth, clean and tidy from top to toe, looking precisely as if he had just stepped out of a bandbox. The image is so vivid that one can almost feel the anxiety of a young man like Almanzo as he worried over his appearance. While allowing that a woman had the same issues in getting ready to greet a suitor, the writer was more sympathetic with the young man, who had to “walk up in the cannon’s mouth” of a young woman’s family, “consisting of father, and mother, and grandmother, and maiden aunt, and half a dozen brothers and sisters, and inquire in a trembling voice: ‘Is Miss Arabella at home?’” Poor Almanzo. The Republican column is not just entertaining; it is an invaluable historical resource that provides important clues about male grooming habits during the period, and it also gives modern readers a better appreciation for Almanzo Wilder’s perseverance in courting Miss Ingalls.